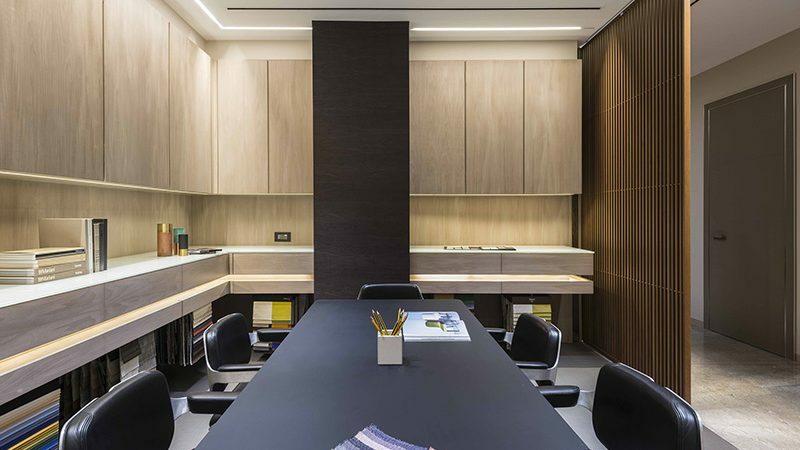 Using a curated selection of interior products from the company’s extensive portfolio, architect Hiral Jobalia of Hiral Jobalia Studio designs a clean-edged, modern and sophisticated office for Sources Unlimited in Mumbai. The entrance facade is delineated with a delicate wooden lattice crafted using the Japanese Chidori technique. The translucent glass hints at the design within. As the 3,000-square-foot site was located in a new building, the design team got working on a bare shell. 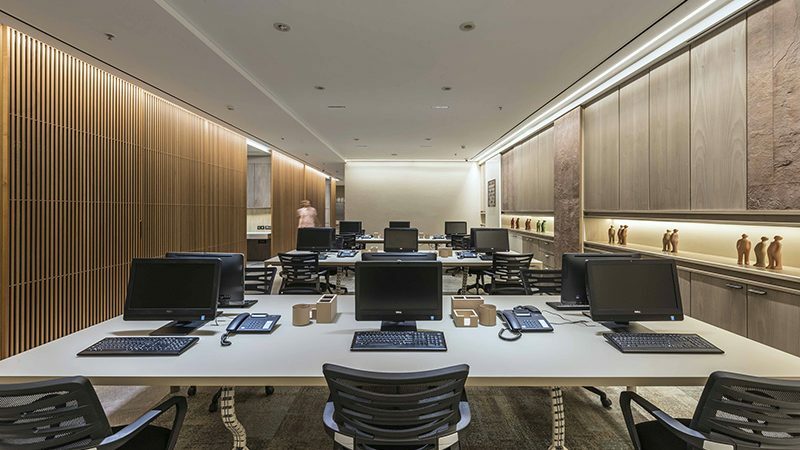 The spatial configuration of the rectangular space was quite simple: a reception block, followed by cabins, meeting rooms and departments such as the accounts section arranged in two bays, separated by a passage. The far end was allotted to a sizeable main cabin. “The space division was obviously dictated by the client’s requirements. 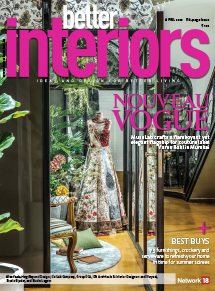 But one important factor was the creation of a sampling room, a dedicated space where customers could make decisions connected to aspects such as finishes and fabrics once they had made up their mind over a certain product,” reveals Hiral. The functions are arranged in two parallel bays in the rectangular office. 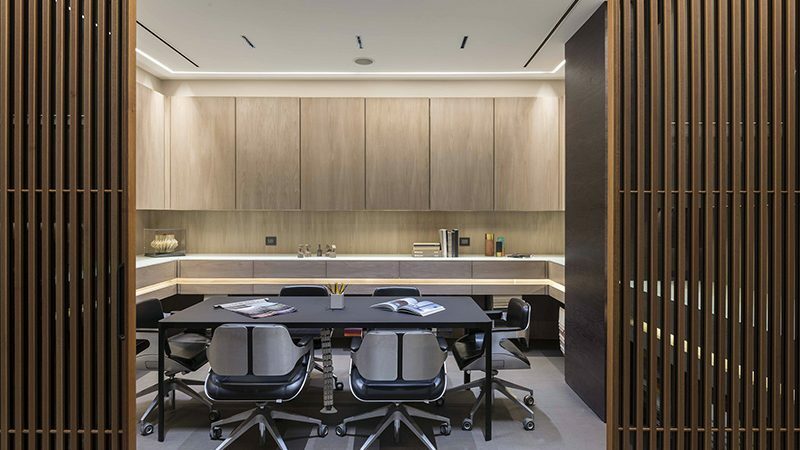 Departments that need a bit of privacy — accounts, a meeting room, the pantry — are shielded by an aluminium and glass sliding partition from Rimadesio called Sail, yet another Giuseppe Bavuso design. 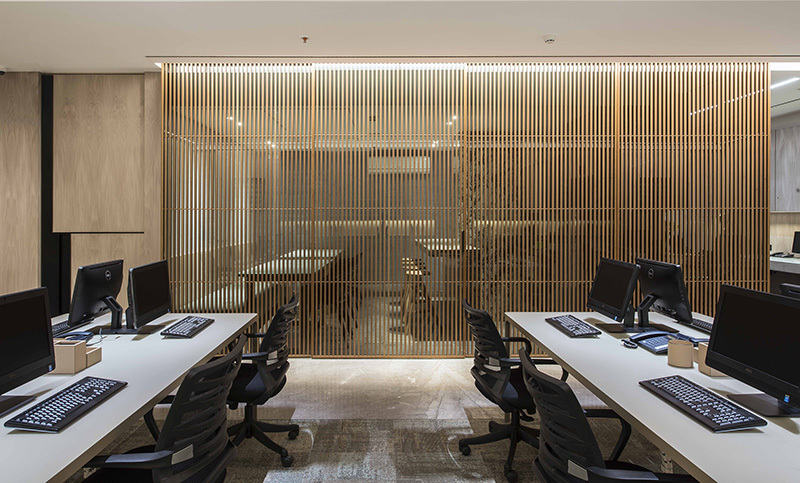 Aside from the fact that the office could not look like a showcase for the company’s products, the second most challenging aspect of the project was that it had to be Vaastu compliant. “We had to be very conscious of colour placements, materials…,” says the architect who loves exploring materials, forms and colours to innovative ends. The final look and feel was a comfortable decor with neutral colours, mostly beige and grey. While attention to detail is a quality that pervades the entire project, there are three instances that especially stand out. The entrance facade lattice has been crafted using the Japanese joinery technique of Chidori, which uses unique joints to assemble objects. 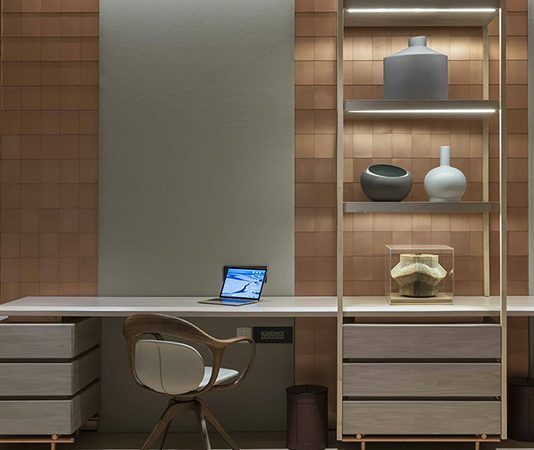 Secondly, the brass accents — delicate legs for drawer units and built-in handles for storage shutters — seen in the furniture of the main cabin, whose walls are lined in a copper mosaic from Italian company De Castelli. 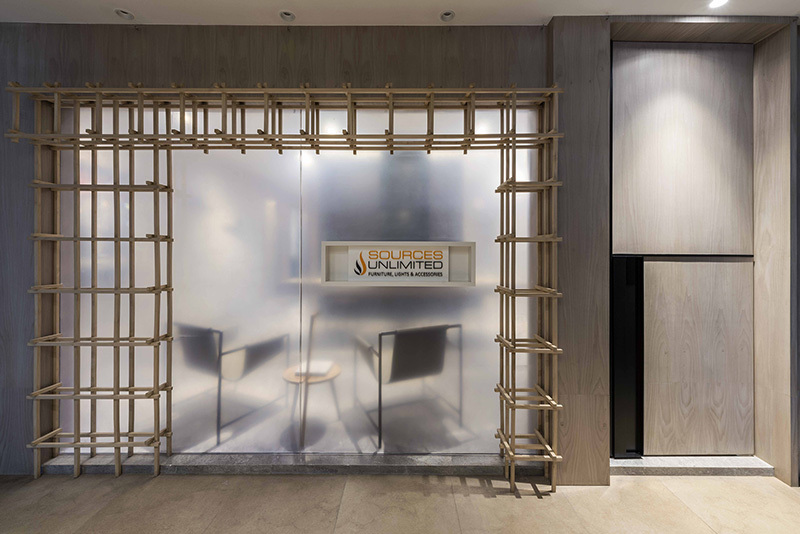 And then, there are the metal lattice panels — featuring a matrix of miniature arches — that are positioned in front of the fabric-lined walls of the conference room to prevent a tedious “flatness” from creeping into the decor. 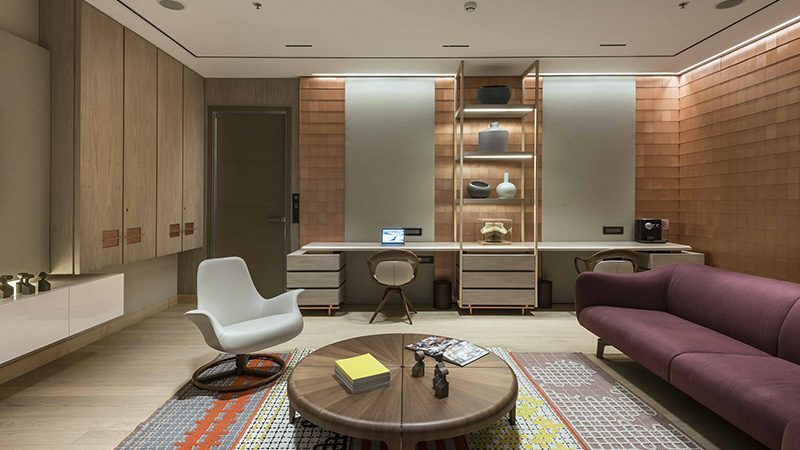 The main cabin at the office looks more like a lounge owing to the elegant Giorgetti Drive Sofa and the stunning matte copper tiles from De Castelli that clad part of its wall. Lighting was resolved very carefully, especially in the sampling and conference rooms (the latter also displays products). 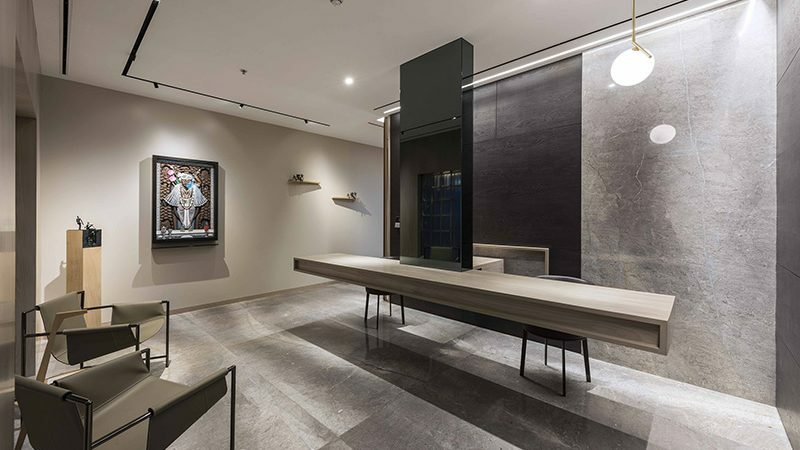 “Accent and task lighting is designed as per specifications in these rooms so that the colour temperature was exact to view the products,” discloses the architect. Lights were sourced from companies such as Igguzini, LED Linear and XAL. a subtle showcase of the company’s line of products. To create an efficient office that would also subtly showcase the products the company dealt in. The reception of Sources Unlimited office is straight-lined, clean-edged, with no obsolete pieces of furniture. The cantilevered desk ensures a certain seamlessness. The Poltrona Frau furniture highlights the spirit of the sparse, modern look. The main workstation area. The storage features a combination of wood and stone veneers. The tables in the main workstation section are from the Rimadesio line-up, Long Island by Giuseppe Bavuso. The floors are lined in a combination of carpet and marble. Clean lines softened with round edged stools and chairs create a young atmosphere in the cafeteria. 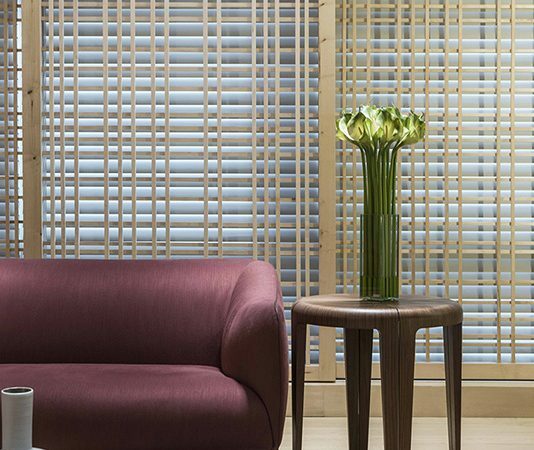 Light coloured wood offsets the variegated beauty of the columnar granite cladding. The sampling room was a client requirement. This is where customers, having selected a product, can finalize its finer details with respect to finishes, fabric, etc. 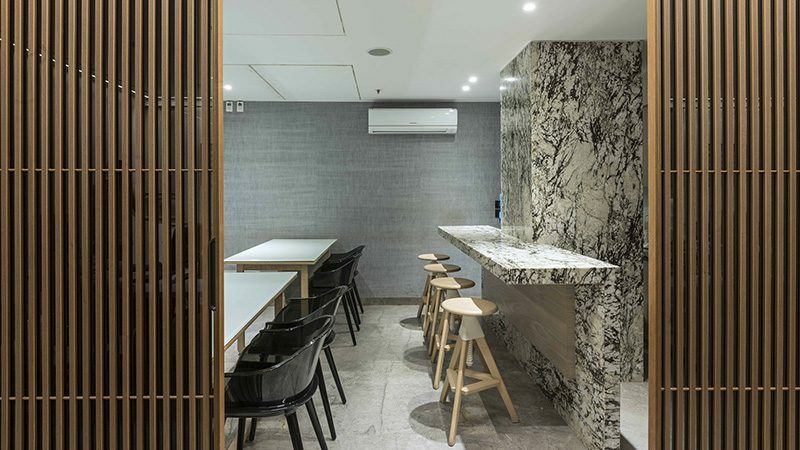 With its spartan, neutral colour palette, the space keeps the focus unwaveringly on the products. 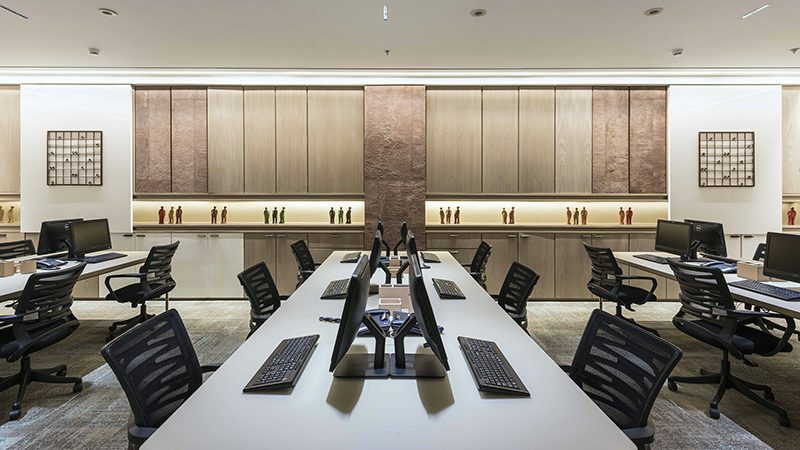 At the sampling room the use of dyed veneer, LED lighting and a clean, minimal look leave out any visual distractions, and make the task of selecting materials or comparing swatches that much smoother and more effective. The 10-seater conference room. The fabric-clad wall panels — an acoustic requirement — were saved from appearing too flat by adding lattices with arched forms, in a few places. 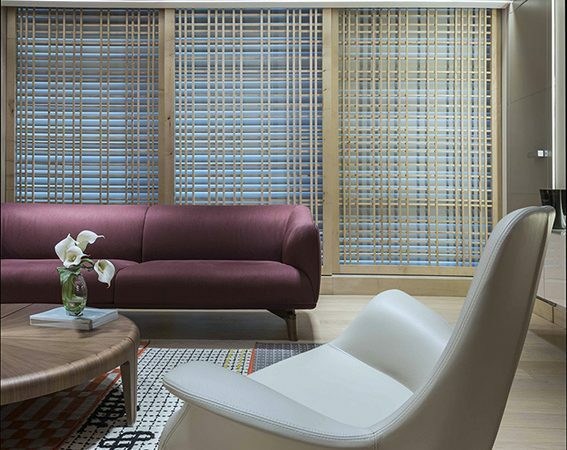 The fabric-clad wall panels — an acoustic requirement — were saved from appearing too flat by adding lattices with arched forms, in a few places. 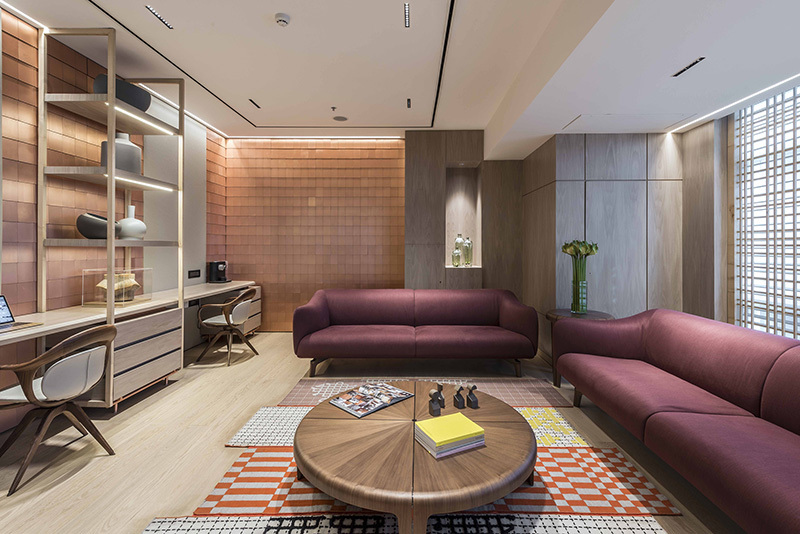 The burnished beauty of the wall balances the demure tones of the rest of the materials, mainly veneered wall expanses and the engineered oak wood floor. 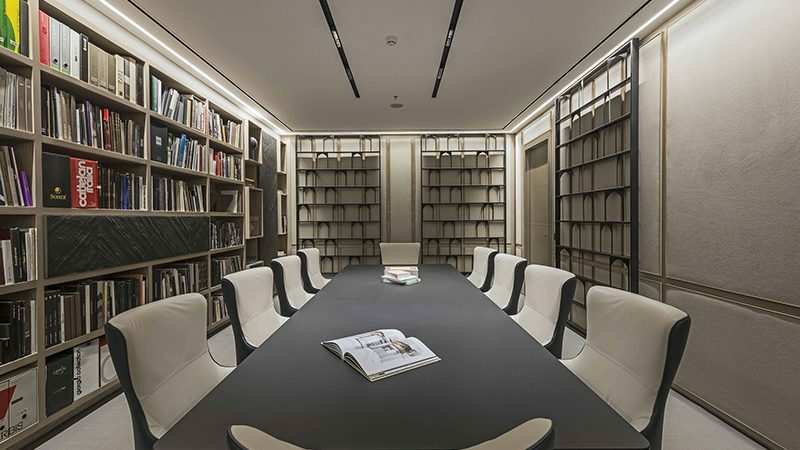 In the main cabin, the chairs at the work desk are Norah, by Giorgetti. Another different note is a leather-clad door as well as a latticed window in oak wood. 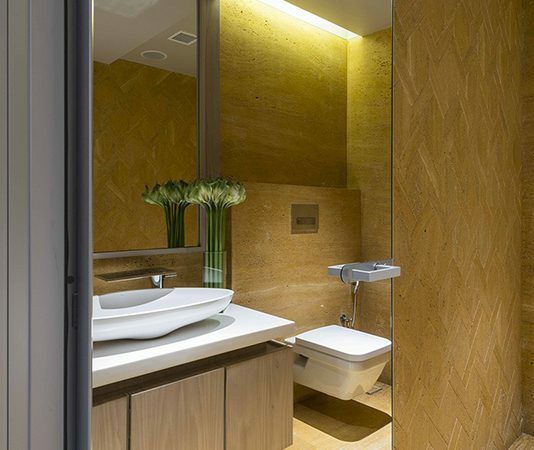 The washroom features honeyed expanses of travertine, some subtly patterned for visual dynamism.